So, you have completed your thesis. Then, what is next? 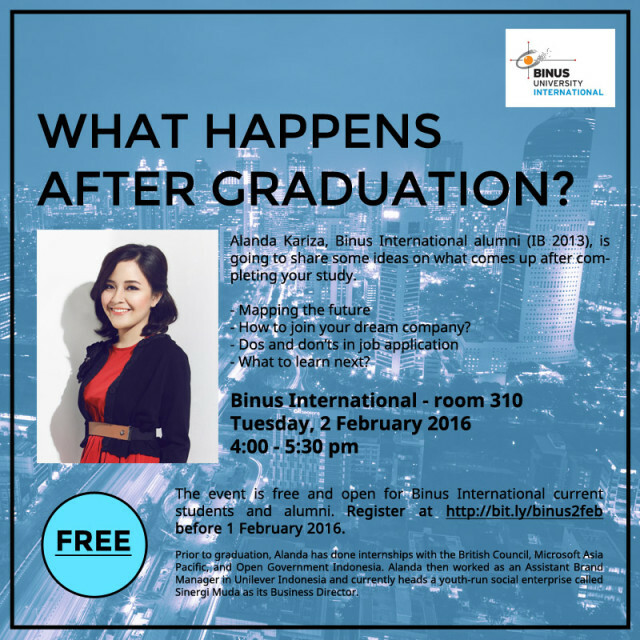 Alanda Kariza, Binus International alumni (IB Class of 2013), is going to share some ideas on what is next after graduation. Mapping your future. How to join your dream company? (Dos and don’ts in writing your CV, Further assessment and interview ) What to learn next? The event is free and open for public. Also, sign up for an exclusive, one-on-one CV writing clinic with Alanda at 3:30 – 4:00 pm by sending your full name, major and phone number to dhputri@binus.edu before 1 February 2016. Only three seats available for the CV writing clinic. Prior to graduation, Alanda has done internships with the British Council, Microsoft Asia Pacific, and Open Government Indonesia. Alanda then worked for a couple of years in Unilever Indonesia as an Assistant Brand Manager in its prestigious Unilever Future Leaders Programme, and currently heads a social enterprise called Sinergi Muda as its Business Director. Alanda is also an author who has published 8 books and spoken in distinguished international forums, including the 100th International Labour Conference, One Young World Summit 2011, Pontifical Council for Culture’s Plenary Assembly 2013, and the World Economic Forum Annual Meeting 2016.